I just said goodbye to my old windows mobile phone yesterday. Got myself an LG P500 (with a stock Android Froyo) since it came bundled with my mobile line (Globe). I have to say that this mobile OS is definitely for geeks. 1. 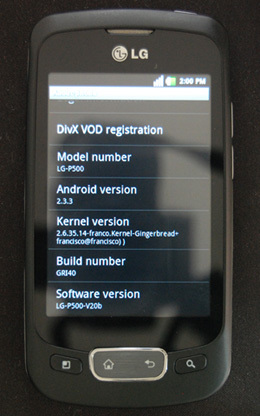 First, I installed the stock Gingerbread ROM from LG with these instructions. The ROM take note is from LG India, I chose this ROM because it is not locked to any mobile carrier. 2. After the upgrade, I rooted my phone with these instructions. Look up post #2. 3. Then I installed ROM Manager with these instructions. I installed this one because I wanted to make sure I have a backup of my ROM before I do anything else with it. 4. Then I installed Franco’s kernel for Gingerbread using ROM Manager. 5. Finally, I installed SetCPU and overclocked my phone to 729 MHz from 600 MHz. WiFi – works as expected. GPS – works as well, not very accurate, was off by about 100 meters but I guess this is usual. FM – works as expected, the channel scanner was very helpful in setting up the stations. Bluetooth – works as expected, was able to pair it to my Plantronics headset and laptop with Win7 64bit. File transfers were a breeze though I had to set it up first. Camera – no kinks whatsoever, works as expected no bugs found so far. 3G/HSPDA – works as well but I disabled it on purpose since I have WiFi available most of the time. Tethering – this was the only thing that wasn’t working. I’m able to connect when the mobile hotspot was enabled, however, I can’t view any http data on my laptop. I can ping a domain though and it resolves to an IP but other than that nada. I chose the Franco kernel instead of stock because I wanted to try out the SmartassV2 governor for SetCPU. So far no complaints about it, I get a good mileage out of my battery (a single charge lasts me about 2 days) and the UI works smoothly. A word of caution, IF YOU DON’T KNOW WHAT YOU ARE DOING THEN DON’T DO IT. If you do not understand the steps that were done or how to recover your original ROM in case something goes wrong then there’s a chance that you might brick your phone. I will not be liable if you brick your phone. Are you using the stock LG gingerbread ROM? If yes, was there any network coverage before you switched to the franco kernel? I’ll need a bit more detail before I can help you with your inquiry. Users of stock Android devices such as the Google Nexus One or Nexus S also need to unlock its bootloader before they can proceed. To do this, simply follow our guide on what is the bootloader and how to unlock it for stock Android phones . Once you have done this, you may proceed to the next step. Hi Gokul, sorry bout that, I’ll see if I can find an alternative link. Already have note 3 and I already gave away my old LG P500.